Currently, there is very little information about brewing beer with S. eubayanus. A search of journal articles on Pubmed (retrieved February 2016) yields only two or three articles relevant to brewing with this yeast. I think this is mostly due to it not being readily available to the brewing community. The yeast can be obtained through a research-only license from PYCC, and is restricted to R&D purposes only. For that reason, only a few academic labs have published the fermentation experiments with this yeast, and there is no real-world information available from breweries. A search of homebrewing forums and an in-depth Google search only finds a couple other homebrewers who have done anything with S. eubayanus. Bret Baker presented on his experience with the yeast at the 2014 National Homebrewers Conference. Kristoffer Krogerus co-authored two academic papers analyzing S. eubayanus, and his blog, Suregork Loves Beer, references a blonde ale he made. Both Bret and Kristoffer report similar results with their beers as I found when I brewed a German pils with the yeast. When I tasted my eubayanus brew, I thought it was okay, but not great. That got me thinking that either this yeast just doesn’t make great beer or I just haven’t seen the yeast’s full potential. With only three documented beers brewed with the yeast, there were still many unanswered questions: What are the optimal brewing parameters for this yeast? What are the best mash time and temperature? What is the optimal pitching rate? Which hops work with the yeast? Which malts? What beer styles are best suited for this species? I decided that more needs to be known about brewing beer with S. eubayanus. To obtain as much data as rapidly as possible, I enlisted the help of a couple guys and we decided to host a competition to encourage brewing of a diverse range of beers with S. eubayanus. This will allow us to see how this yeast performs in the real-world, not in a lab. So how did this work? First, we partnered with White Labs to provide pure cultures of S. eubayanus. 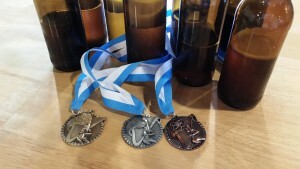 Everyone received a vial of yeast and could brew almost any beer they want, as long as S. eubayanus was the only yeast and maltose was the only fermentable. We then compiled the fermentation data to determine which factors contributed to the best fermentation conditions. The beers were judged in a BJCP-based competition so we could determine what styles of beer are best brewed with it. Further, White Labs performed detailed chemical analyses of the beers to determine the level of various flavor and aroma compounds in the beers. The details of the experiment, as well as the results, will be featured in an upcoming issue of Zymurgy and will be presented at the 2016 National Homebrewers’ Conference. I will publish a summary after the article is released. In the meantime I am continuing to experiment with the yeast, so look for more posts in the future. Continue reading for results of the experiment. Hi Jared! This seems like a very interesting project! I would love to hear some more details and share some of my own experiences. Is there an e-mail address I can contact you with?